Using Intel® 2nd and 3rd generation Core™ i3/i5/i7 processors based on 32nm and 22nm process technology supporting up to two Cores / four threads at 2.2 GHz and 4 MB level 2 cache, the MIC-3395 blade boosts computing performance deploying the latest virtualization, techniques and CPU enhancements. Onboard soldered DRAM with ECC support and optional memory expansion via an SODIMM socket extend the memory to a maximum of 16 GB to support the most demanding applications in high performance or virtualized environments, supporting up to 4GB per virtual machine. Dual channel design and memory speeds up to 1333MT/s for 2nd generation or 1600MT/s for 3rd generation processors along with increased cache size and cache algorithms guarantee maximum memory throughput. Combined with the powerful Intel® QM67 chipset, these new processors offer improved I/O performance by leveraging 5GT/s DMI and PCIe interfaces. 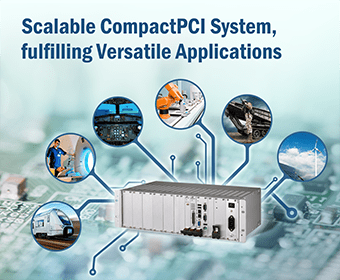 An onboard XMC/PMC site with PCIe x8 gen.2 connectivity can host high speed offload or I/O mezzanines such as the MIC-3666 dual 10GE XMC card. With SATA-III support and up to 6Gbps I/O, the latest enhancements in storage technology such as high speed SSDs can be employed. Six Gigabit Ethernet ports including two PICMG 2.16 for front and rear connectivity ensure best in class network connectivity. The processor’s integrated enhanced graphics engine (HD3000/HD4000) offers twice the performance over previous generations. With dual independent display support, the MIC-3395 is an ideal fit for demanding workstation or imaging applications. RASUM features integrated in the CPU and chipset combined with PICMG 2.9, IPMI-based management make the MIC-3395 a highly available and reliable computing engine. The RIO-3315 RTM module supports one PS/2 connector with both keyboard and mouse ports, two USB ports, two RS-232 ports, two SATA ports, two DVI ports, and two Gigabit Ethernet ports. In case the SATA disk drives and SATA RAID support of the QM67 do not meet performance and reliability requirements, the RIO-3315 SAS version supports a 4-port SAS controller with RAID and failover support.